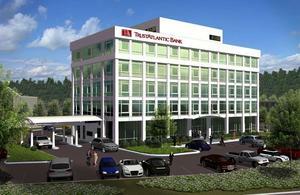 The old Time + Temperature building has been gutted and the TrustAtlantic center is one it's way to becoming a reality. Here's what to expect once completed. For those of you who not familiar with this project, it's across Creedmoor from Crabtree Valley Mall, at the corner of Glenwood & Creedmoor. Ugly but now with glass! Meh. Well at least it will fit in well with the crappy looks of the surrounding buildings in Craptree. Yes. It really is craptacular! RALNATIVE - any word if this is being stripped to the beams completely or just reclad?